Do you enjoy days spent sewing quilts? Love to create homemade gifts for your loved ones? If so, it is likely you are going to be making a lot of the accoutrements necessary for your wedding. The trick to a functional wedding is to know what things are worth creating, and what things are better to buy. Included here are a few things you can easily craft for your wedding without going overboard. While you may not be able to create intricately patterned napkins yourself, you can make simple cloth napkins. By following an easy pattern, it is completely possible to buy a bulk fabric and sew it into neat squares. This can be an unnecessary step for many people, but if you are truly trying to create a personalized touch and save money, it is a great idea. Tablecloths are nearly as simple to create as napkins. You will be working on a larger scale, but it is still a simple sewing task that is comprised mostly of edging. If you have a special fabric pattern that is meaningful to you it can be nice to integrate this into your reception by creating your own tablecloths. One of the most popular choices to make yourself is your personal centerpieces. With a great diversity of options available to you, centerpieces can be as simple as dried flowers or as complicated as miniature terrariums. 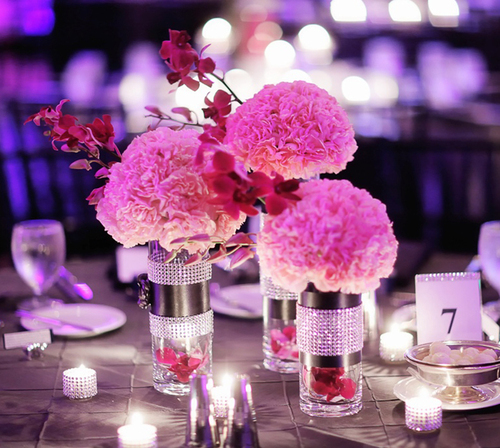 You will need to feel out your personal color scheme, theme and venue idea to know what will work best for you. Wedding favors are a great way to offer your guests a memento to take home with them that is memorable and personalized. Again, this is something you can make incredibly simple or complicated. Some choose to create a bulk candy bar in reused jars that allows each guest to fill their own treat bag. Or, you may decide to do a more generalized approach and tie up fabric pouches of candy in advance. For the especially crafty, you can consider creating wedding favors that will last longer than the drive home. Buying stemless wine glasses in bulk and then painting your last name and wedding date onto them can give your guests a long-lasting memento. You also may choose to make candles with a favorite scent or paint small pots filled with succulents. Floral arrangements can easily end up being one of the most costly aspects of your wedding. By simply growing and harvesting your own flowers, you can make your wedding extremely personalized and beautiful. Summer weddings will benefit greatly from a wildflower bouquet while a winter wedding may look wonderful with bouquets of snowdrops.